Sometime around the first week of October — and after the first solid rains of autumn — sunny afternoons on Oregon’s Deschutes River conjure up a little magic. The sun rides a little closer to the horizon, and the rays flow down into the deep, desert canyon and light up the clear, slightly greenish water. 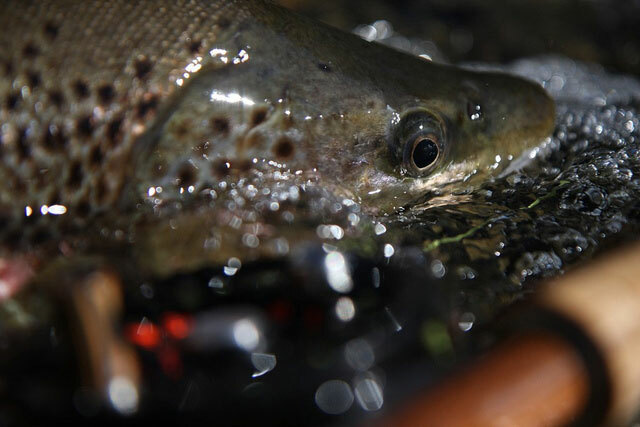 During the scorching days of August and September, sunlight sears directly into the water — and pushes the wild redsides rainbow trout into the depths — or in the deep shade of bankside trees. Bugs — usually clouds of caddis — rarely hatch until the sun is off the water. In October, the air is much cooler. Gentle, sideways rays of sunlight warm up the water and spark massive afternoon hatches of tiny Blue Wing Olive mayflies — even on sunny days. These bugs are a tiny size 22 most of the time, and it’s hard to see these mayflies on the bouncing water of the runs and riffles. But find a backeddy — especially on a still, windless day — and rafts of the tiny bugs float around in the swirling currents. The trout move into the eddies and tip and sip all afternoon long. I’ve fished the Deschutes like a maniac since 1983, but this subtle hatch always surprises me. Maybe it’s because October is also the prime month for summer steelhead on the Deschutes, and I’m often knee-deep and casting a long line into the rolling, steady current of rocky tailouts and runs. Last weekend, I spent the morning casting and swinging a Street Walker steelhead fly in two prime runs. I got one strong take just as the fly drifted over a sunken boulder garden. I bungled that fish. I didn’t see any trout working in the faster steelhead water. Steelheading is a happy addiction, but the scent of skunk often drifts in the air if you don’t find shaded water. I lost the shade, but put on a sink-tip line and swung my fly into the darker, deeper water. Later, while I was sitting on the truck tailgate eating a very late lunch, I thought flying ants were landing on my sandwich. I took a closer look, and they were Tiny Blue Wing Olive mayfly spinners. Their clear wings sparkled in the soft sunlight. It was like meeting an old friend you haven’t seen for a year or so. I blew the mayflies off my sandwich, crammed it into my mouth, rigged up my Sage LL 389 fly rod and headed for a favorite eddy. I stopped at the high bank overlooking this eddy, which is just downstream of a long, roiling riffle/rocky run that pumps out bugs. An outcropping of rocks creates a seam between the fast riffle and the swirling, sucking currents of the eddy. Seen from the high bank, this eddy looks like a weather satellite photo of a brewing hurricane. The swirling currents spin into a circle, with a traveling eye of calm water in the center. Several bubble lines showed where bugs washed into the eddy from the riffle. I saw trout rising in the bubble lines, and three big redsides — one was at least 18 inches — sharked around in the slack water eye with their dorsal fins out of the water and sucked down bugs. I crept down the bank like a heron. A fallen alder tree made a nice blind on one side of the eddy, and I slowly waded into position while watching trout tip and sip. I saw some freshly hatched duns, but I tied a spinner pattern onto a four-foot-long tippet of 6X. Why? Well, I saw spinners on my sandwich, and a spent spinner is also a pretty fair imitation of a crippled dun that never made it into the air. The Sage LL is ancient, but it’s the best rod I own for sneaking around and making precise casts to trout that have been pestered all summer long. It’s accurate, will cast just the leader — and that slower action cushions a light tippet. It was just 3:15 pm, but the October sun was already sliding down in the sky, and the high canyon wall across the river puts this spot in shade earlier than other spots. A line of shade steadily moved across the Deschutes toward my spot. Knowing which spots get shady first is a key skill on this river. A nice trout was rising just 10 or 12 feet away, so I pulled off some line — but just cast the leader with a little downstream reach. I then used a quiet, downcurrent mend to feed some line into the drift. The fly drifted over the fish, and it moved to the fly — and then turned away. Amy Hazel, one of the Deschutes’ true experts and partner in the Deschutes Angler fly shop in Maupin, OR, tells everyone to change their fly right away if a trout rejects it. Show that fish that same fly, and it will probably spook. That traveling line of shade was now right on the seam between the riffle/run and the back eddy. I tied on a size 22 Sparkle Dun and made another cast. The fish didn’t see the fly. I made another cast. No reaction. Either this fish didn’t care — or I just wasn’t putting it in the right place. The fish tipped up and ate the fly on the third cast. I set up, and the fish zipped through the eddy. Line slid off my chirping reel. Then the trout jumped — high over the current line between the fast water and the eddy — and right on the edge of the shade. The fish shook in the air, and, for a wink of time, a halo of water droplets glowed in the sunlight slanting into the canyon. And then the fish was running hard in the fast water. The low light of the October sun felt hot on my face, but I knew the cool shade was on the way.